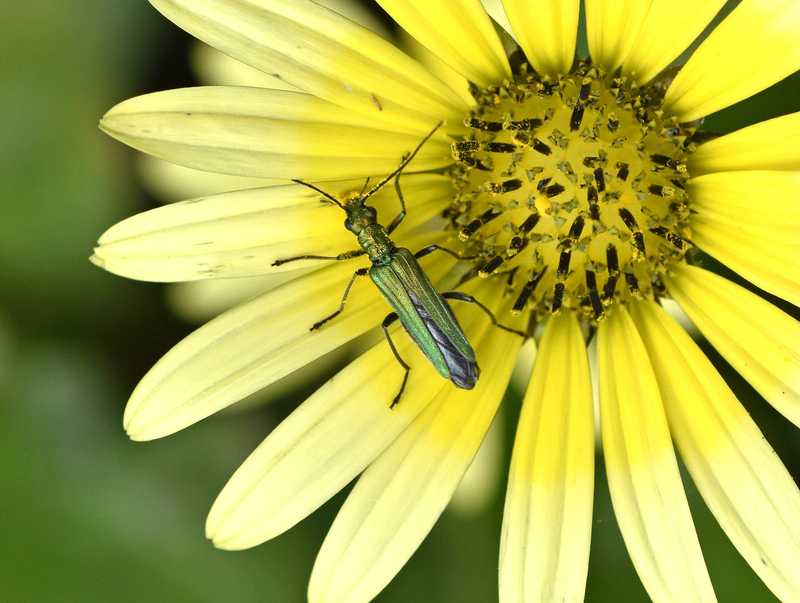 The thick-legged flower beetle, Oedemera nobilis (Family Oedemeridae), is a common pollen-feeding beetle found in flower heads during the spring and summer. 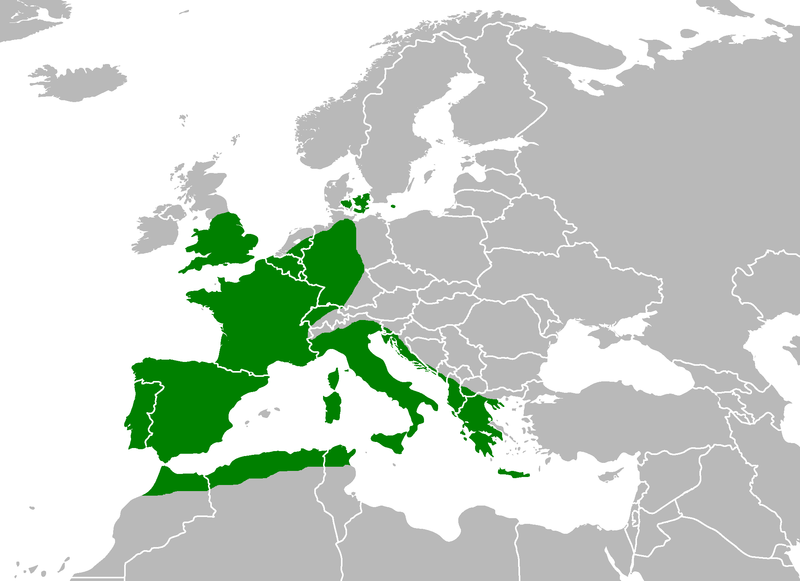 They occur throughout western and southern Europe. I took these photographs of O. nobilis beetles in NW Spain (Galicia) in June 2018. The enlarged hind legs (femora) are only found in the males; a sexually dimorphic feature. It is possible that they are used by the males during courtship or mating? Perhaps in competition with other males, or as an exaggerated feature favoured by females when they choose their mates? This is such an obvious topic for research, but I cannot find any academic studies of this behaviour in this species. 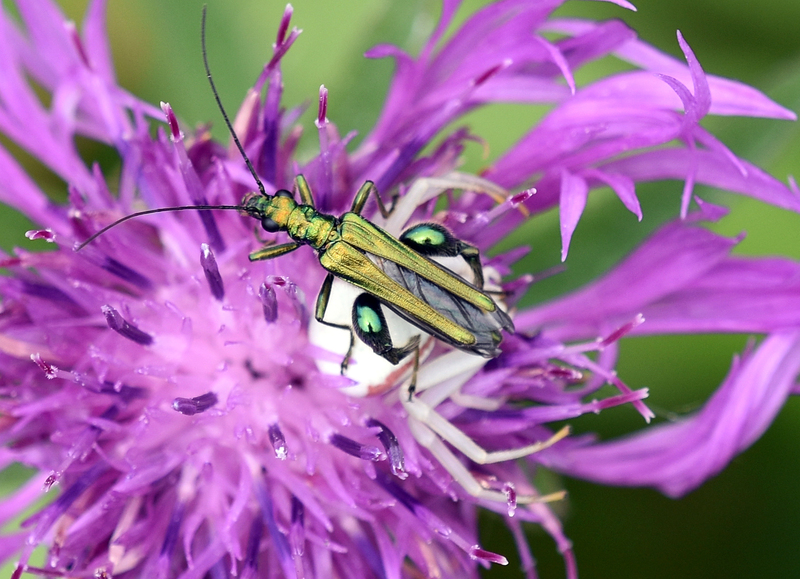 The adults – 8-11mm in length – are quite easy to spot in open flower heads of many plants, of which they are pollinators, such as cow parsley (Anthriscus sylvestris), ox-eye daisy (Leucanthemum vulgare), bramble (Rubus fruticosus), thistles and many other species. The larvae are harder to spot, feeding and developing within the stems of plants such as thistles (Cirsium). One characteristic of this species is that they do not do their jackets up tightly! 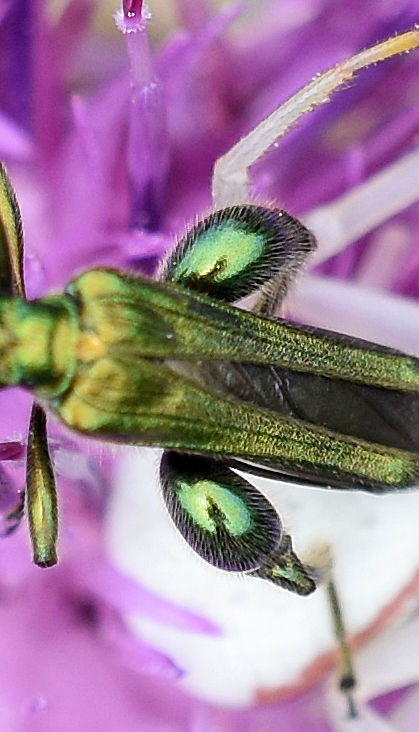 In other words, their green elytra (or wing covers) are pointed and gape apart, i.e. they do not meet up properly, especially at the far (distal) end. It is easy to see why they are such good pollinators (below) because they get covered in pollen and move from one flower head to another! The yellow flowers shown here are Cape daisies (Arctotheca calendula): an introduced species, very common in NW Spain and featured in another blog. 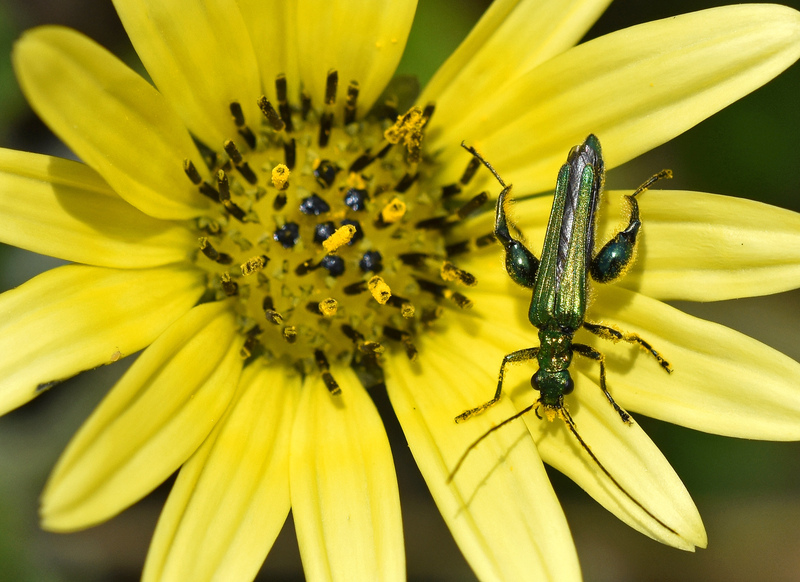 There were O. nobilis beetles in many of the flowers, so they were clearly very attractive to this species. Female O. nobilis beetles appeared to be less common in these flower heads, on the basis of a very cursory survey, but I did manage to find and photograph one (below). The females lack the thick hind legs but are similar in all other respects, as far as I can tell. In another place, a white crab spider (Misumena vatia) was waiting for prey on a thistle head (below). 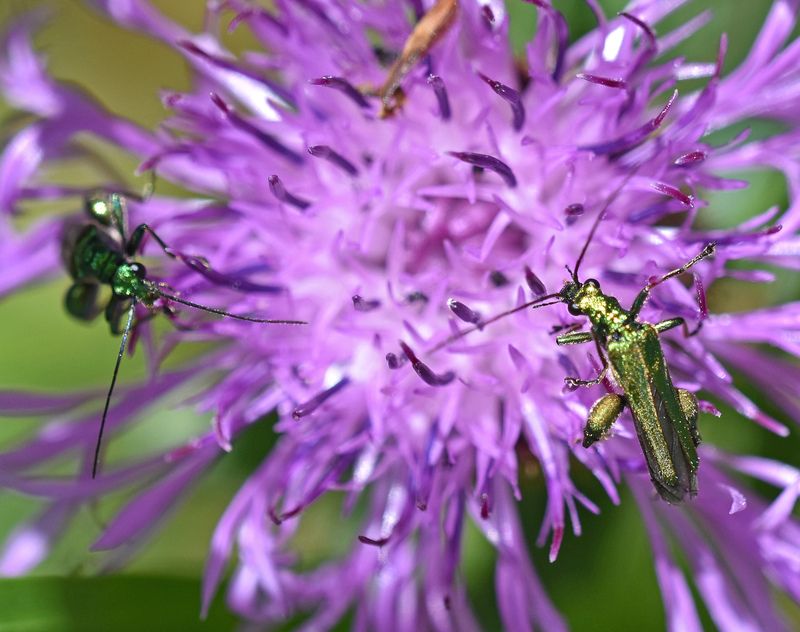 Suddenly, a Thick-legged flower beetle (Oedemera nobilis) arrived on the thistle and stood right on top of the White crab spider. Clearly, it was not the right prey item for the spider. Either it was too large or too difficult to eat? 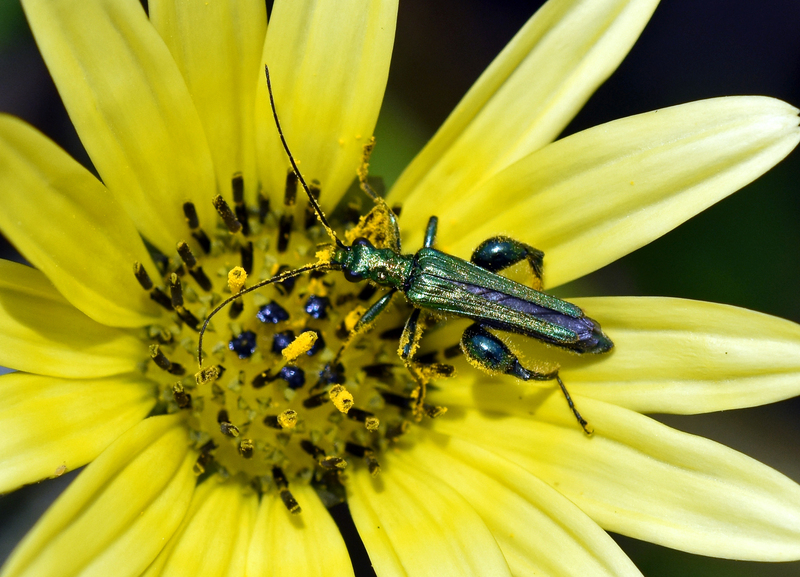 In any case, the crab spider made no move the capture the beetle which wandered about the flower seemingly unconcerned about the presence of a would be predator. 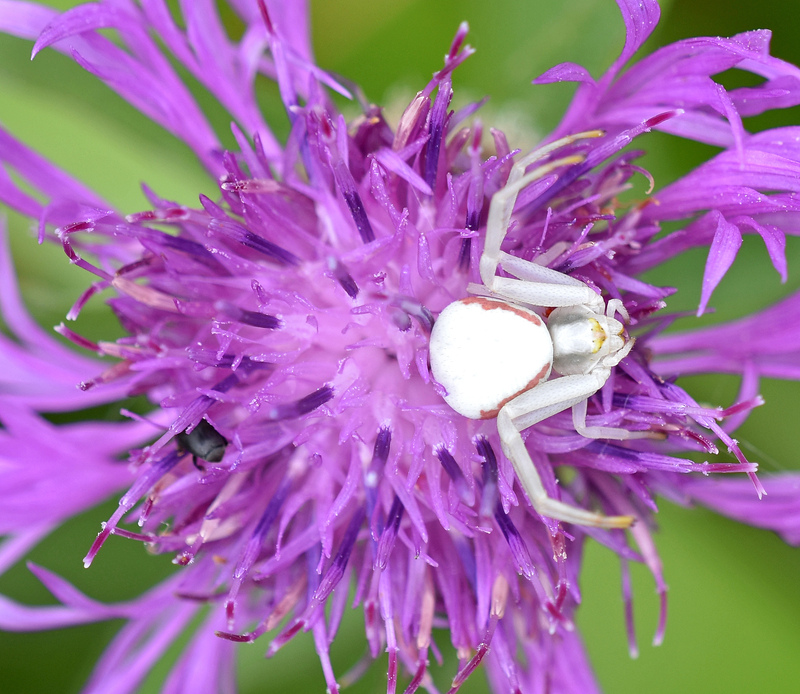 Crab spiders are certainly capable of taking prey items at least as big as themselves and sometimes larger. Google ‘Misumena vatia + prey‘ and there are many images of them with bees, wasps, butterflies, moths, flies and so on. Perhaps these beetles with their huge back legs are just too strong for them? Here is a close up of the big back legs, which are also quite hairy. 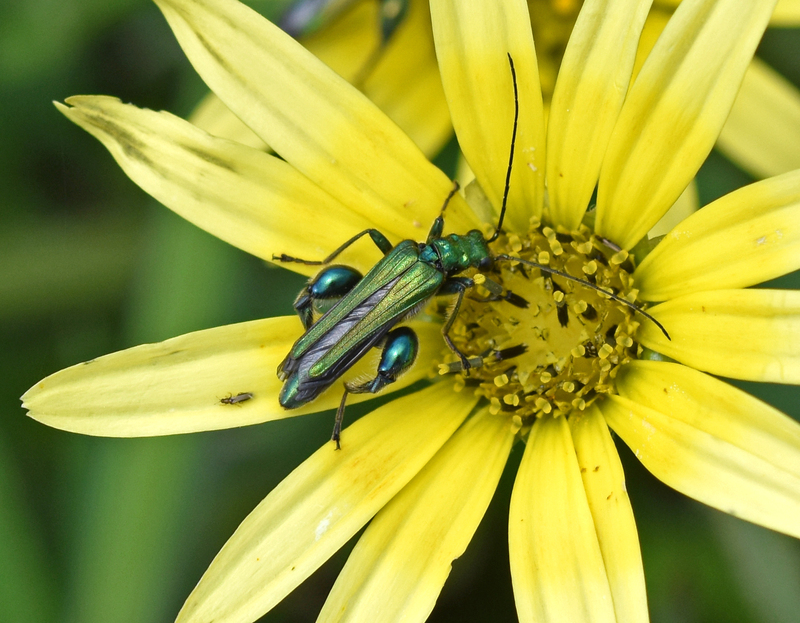 Thick-legged flower beetles are not so tolerant with other males of their species. 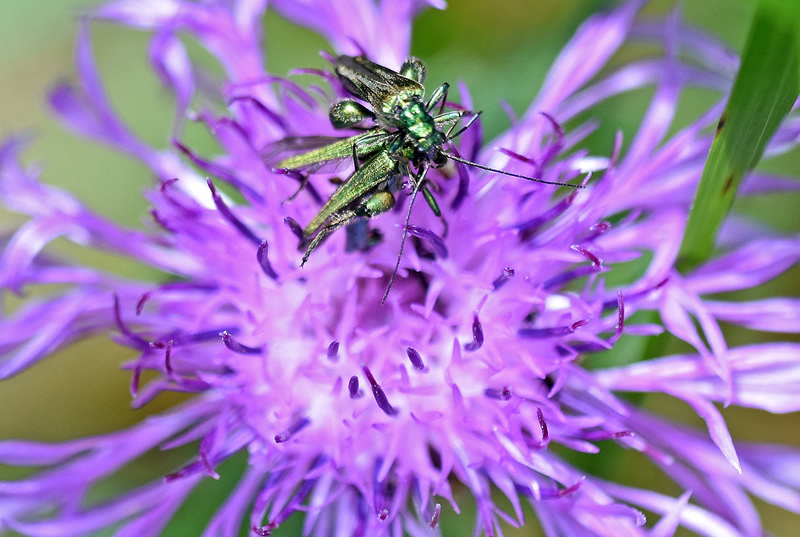 I was photographing one on another thistle when I witnessed an altercation between two males (below). The tussle was very rapid and I was lucky to get just one shot; if I knew that they were going to fight I might have chosen a faster shutter speed than the 1/000th sec I took this photo with! After the fight the two beetles settled down to feeding on the same flower. Perhaps it was a sort of dominance thing? Sizing up who has the fattest legs! Interestingly, one of the males – the one on the right in the following photo – appears to have slightly thinner hind femora; not so shiny and enlarged. I was surprised that I could find no academic studies on the biology or behaviour of this species (at least on Google Scholar). They are so common and abundant, they would make good subjects for investigation. Grateful for any information if readers of this blog are aware of any studies or observations on the function and use of the large hind legs.